Moto Help UK Provider - An On Demand Car Repair Service. What is Moto Help UK app? Many a times we come across a situation where our vehicle breaks down mid-way ( Due to an engine issue, tyre, battery, fuel or an accident ). At such situations the only way to handle it is by calling a help service. Now, Just imagine you have a Moto Help UK service app in place to avail the nearest available service provider! All you need to do is login to the app and click " Find Me Here ". The app will automatically find your location and find the nearest available service provider and assign it to you. 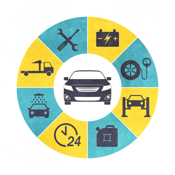 Also use when need : Air Con service, diagnostics, key cut, alloy repairs, tow bar fitting, windscreen repair, wrapping, hands-free, full service, and many many more. - Any user can press the “Find Me Here” button to initiate the geo-relevant service. Based on the location of the user, the app will initiate the process. - Once the service is done, the user will have the provision to review the service provider who has serviced them. Alternatively the user can also read previous reviews of the service provider before availing the service. - Once the service is done, the client will have the ability to rate the service quality rendered as well. Download and start using it.